"This is all because, I mean, count the number of times he uses the word I in any speech, and compare that to any other president. Remember when he announced the killing of bin Laden? That speech I believe had 29 references to I – on my command, I ordered, as commander-in-chief, I was then told, I this. You’d think he’d pulled the trigger out there in Abbottabad. You know, this is a guy, you look at every one of his speeches, even the way he introduces high officials – I’d like to introduce my secretary of State. He once referred to ‘my intelligence community’. And in one speech, I no longer remember it, ‘my military’. For God’s sake, he talks like the emperor, Napoleon." Since Krauthammer can't be bothered to check on mere matters of fact, I found the transcript of President Obama's speech about the death of Osama bin Laden, and checked the pronoun counts and rates. In fact, the speech contains 1396 words, of which 10 are 'I', for a rate of 0.7%. Perhaps Krauthammer was thinking of President Reagan's Address to the Nation on Events in Lebanon and Grenada, which did have "29 references to I" — though the overall word count was higher, so that the rate was exactly the same, at 0.7%. It's a tribute to our nation's culture that a man like Krauthammer, who so consistently expresses blatant quantitative falsehoods about national leaders, is not only out of jail but comfortably established as a commentator for a major media outlet. Didn't I hear something, maybe on NPR, about the use of "I" in interactions being associated with less powerful positions? It was unexpected, when I heard it, and I don't remember details, but I suspect one or another reader/writer here has a much better grasp of the research and such. My point is more asking if looking for "I" in political speeches tells us anything useful at all. Interesting that in the one paragraph cited, Krauthammer uses "I" three times to refer to himself: "I mean," "I believe," "I no longer remember it." What a narcissist he must be. My suspicion is that whenever Obama says 'I', Krauthammer feels a stabbing pain in a sensitive area. Jan: Morning Edition recently ran an "encore presentation" of a segment that originally ran in 2012, interviewing the social psychologist James Pennebaker about his work on function words. Pennebaker did indeed find that first-person pronouns are used less frequently by a higher-status person addressing a lower-status person than vice versa. For more, see Pennebaker's book The Secret Life of Pronouns (which I reviewed for the NYT Book Review). Pennebaker also contributed a guest post here in 2009 (linked above): "What is 'I' saying?". Possibly CK meant to refer to the total number of first-person pronouns, not just the word "I". Still, I could only find 2 uses of "me" and 3 of "my", so it still doesn't make 29. Thanks, Ben! That's very helpful. Actually, Krauthammer is referring to Obama's self-references–all of them, not just personal or possessive pronouns. He lists "commander-in-chief" as one of the examples. Obama did not, in fact, refer to "my intelligence community" after the bin Laden raid, as Media Matters notes. (He said "our intelligence community.") Krauthammer is correct that Obama once (once) referred to "my military," in his press conference of September 6, 2013 ("My military assured me that we could act today, tomorrow, a month from now…"). But George W. Bush said "my military" at least twice during his presidency. Media Matters quotes him in a 2005 Fox News interview with Brit Hume, and he also said it in a 2002 speech ("…how confident I am of my military…"). Aside: You're not exactly doing Obama any favours by establishing he uses personal pronouns less often than his predecessors. One of Pennebaker's other, less oft publicized findings is that people avoid "I" when they are trying to distance themselves from a situation, such as when deflecting blame or seeking to avoid scrutiny. Or, similarly, they use "I" more often when taking ownership and responsibility over the topic under discussion. Not that any conclusions can really be drawn from that either, since "I" use (again, per Pennebaker) falls on a spectrum, from "gentle-I" through to "sledgehammer-I", and the uses of each of these are quite different. Simply counting how many I's and me's each of these politicians use tells us nothing. Ahem, not that you're trying to defend him, just fact checking the usual journalistic hoohah. But it seems to me it would be better to attack the misconception about I and self-reference directly, rather than counting words. he talks like the emperor, Napoleon. Can he really have done? "My military assured me" sounds like a shorthand version of "My military advisers assured me." Who would object to that? Pathetic Obamabot who wants people arrested for criticizing the Messiah. Perhaps one should note that saying "I" when taking credit for the heroics of others is different than saying "I' when accepting blame for a tragedy. Well, given the fact that the "major media outlet" for which Krauthammer is a commentator is Fox News, his consistent expression of blatant quantitative falsehoods about [ Democratic ] national leaders comes as no surprise at all. Why are you counting instances of 'I', when Krauthammer is very clearly talking about a more general class of reference to self? He even makes this clear with a list of examples, which includes 'my command', 'as commander-in-chief'. Rather than cherry-pick a couple of speeches, let's take a look at, say, State of the Union addresses by several presidents and do an "I" count. 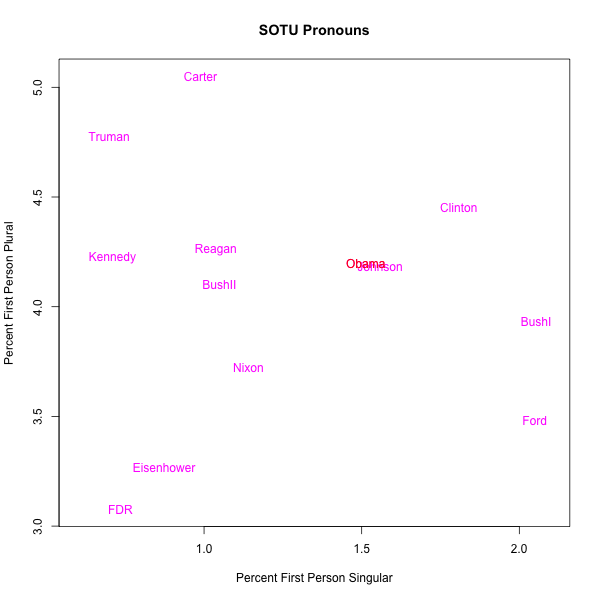 Comparing the last four presidents, Clinton and Obama use "I" with somewhat greater frequency in the SOTU addresses than did Bush Jr. or Bush Sr.
Not to mention the elephant in the room, but maybe what really sticks in Krauthammer's craw (as exposed on Fox) is that when Obama says "I" or "me," or especially "my military" and "commander in chief," Obama's referring to a black man. COCA's word frequency list gives 3,978,625 occurrences of 'I' in the 450M word corpus, a rate of 0.88%. Adding the rates for 'me', 'my', 'mine' and 'myself' will make that even higher. So it could be argued that Obama uses these words considerably less than everyone else. David: And if you wanted more of an apples-to-apples comparison, you could look at COCA's spoken-language subcorpus (drawn from TV and radio transcripts), which has 1,736,933 tokens of "I" out of 95,385,672, for a rate of 1.82%. I counted only 7 instances of "I" in the bin-Laden-is-dead speech. Ok, let's take that speech apart form the self-reference point of view. a) And so shortly after taking office, I directed Leon Panetta, the director of the CIA, to make the killing or capture of bin Laden the top priority… [Insinuates that the previous administration or some other political actors didn't consider this a priority. If he didn't mean it, he'd better emphasized the continuation of the bin Laden hunt rather than his role]. Overall, a poor job for a narcissist. @Ben. Thanks for those extra numbers, which reinforce my basic contention. This was the first time I had accessed COCA's word frequency lists, so I was just finding my way around, plus I did that research over breakfast, which is not conducive to in-depth exploration. If you're convinced that Obama is uppity or arrogant, you're going to fix on every pronoun that seems to confirm that opinion. But you can't help thinking there's a measure of projection here, as well. Will and Fish are neck and neck for the most immodest style in all of American prose, and it's not surprising that they'd read Obama's impenetrable self-possession as the sign of a bristling ego. When you're a narcissist, every doorknob becomes a mirror. "I guess, adding Bush's name should neutralize any doubt about Obama's ego-inflation in this one." I can't for the life of me parse what's being neutralized by this sentence. But that's Language Log for ya. @Peter Ramus: I meant, if there was any suspicion (not "doubt", I used a wrong word) that this sentence was formulated the way it was just to show the Obama's importance, this suspicion should be removed by mentioning of Bush's name. Does it make more sense this way? It might still inflate the role of the presidency in national discourse, but not Obama's personally. @Alex: And of course, if you make a mistake, you're apparently damned if you say "Mistakes were made" and damned if you say "I made a mistake". Hasn't he written this exact paragraph in the past? Also, 'my military' isn't in the speech at all. It looks like Stephen Colbert might be a Language Log fan. On Monday's episode (Sept 23), he ran a bit about EXACTLY this topic. No shout out to myl, though. Video http://thecolbertreport.cc.com/videos/x58aop/charles-krauthammer-on-obama-s-mental-state.